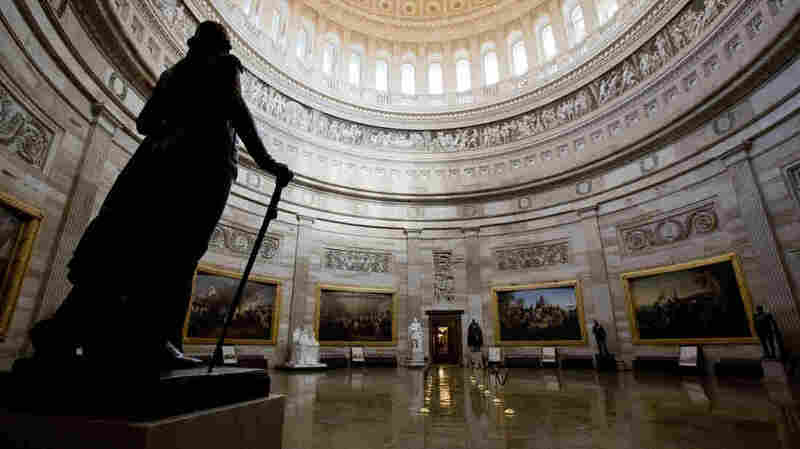 The U.S. Capitol Rotunda stands empty on Monday, a result of the partial government shutdown. The shutdown has affected the administration of the Violence Against Women Act, which expired Friday at midnight. The partial shutdown of the U.S. Pat. Government, which is affecting more than 800,000 federal workers and numerous government agencies, also has consequences for the Violence Against Women Act, which expired at midnight on Friday. Separately, both the House and the Senate passed spending deals that would have extended VAWA until Feb. 8. But because the law's future became inextricably tied to the larger budget debate, which depended on a dispute between Democrats and Republicans over funding for a border wall. survivors of domestic violence and sexual assault. Its expiration does not prevent all of these programs from being administered – according to The Washington Post, grants already awarded under the law will not be affected. But future payment requests from programs that receive VAWA funding will be delayed until the law is reauthorized. According to Roll Call, the Department of Justice and the Department of Health and Human Services administer most VAWA programming. Some VAWA programs that HHS administrators may continue to receive funding even though VAWA expirations have expired; Congress approved fiscal 2019 funding for HHS in September. But funding for the Department of Justice is based on the current budget debate. In a letter she sent to House Speaker Paul Ryan in September, House Democratic leader Nancy Pelosi criticized Republicans for only pursuing short-term reauthorization of VAWA. When the act was set to expire earlier this year on Sept. 30, it was extended until Dec. 7. And before it expired on Dec. 7, it was once again extended by a short-term bill. That extension ran out on Dec. 21 as the government went into its partial shutdown. In letter, Pelosi references a bill introduced by Rep. Sheila Jackson Lee, D-Texas, in July. The bill extends and expands VAWA, introducing additional measures that prohibit the sale of firearms to people subject to protection orders and to persons convicted or stalking. Roll Call reported this month that the gun-related clauses were probably reason no Republicans supported Jackson Lee's bill. It was never brought to the house floor. In September, 46 House Republicans signed a letter addressed to House Speaker Paul Ryan and Majority Leader Kevin McCarthy, urging them to reauthorize VAWA. "This is not a partisan issue," the letter says. "VAWA has been continually reauthorized on a bipartisan basis in Congress. We must act now to maintain and strengthen this critical law." The letter did not encourage the adoption of a specific bill.